He’s bad, brilliant… and blue. DreamWorks Animation SKG, Inc.’s "mega, mega, mega funny" (Fox News, NY) MEGAMIND flies onto Blu-ray and DVD on FRIDAY, February 25, 2011, giving audiences of all ages even more diabolical fun and surprises they didn’t see in theaters. Packed with laughs, epic comic book action and non-stop adventure, the thoroughly entertaining and refreshingly original story has been hailed by critics as "mind-boggling fun" (Boston Herald) and features the voice talent of mega-stars Will Ferrell, Brad Pitt, Tina Fey, David Cross and Jonah Hill. The "beautifully animated" and "utterly delightful film" (Washington Post) kicks off a Mega-weekend with the debut of an all-new action-comedy starring fan-favorite characters Megamind and Minion. Featuring members of the original voice cast, MEGAMIND: THE BUTTON OF DOOM follows our daring duo on their first day on the job as the new protectors of Metro City. 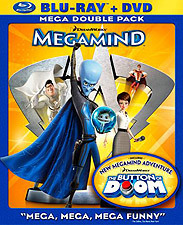 MEGAMIND: THE BUTTON OF DOOM will be available for a limited time only in a Double DVD Pack and in a Blu-ray/DVD Combo pack. The Double DVD Pack also includes a behind-the-scenes look at the cast, a peek into Megamind’s lair, filmmaker commentary, a tutorial on drawing Megamind, a video comic book and much more. The Blu-ray/DVD Combo includes exclusive features such as The Animators’ Corner featuring picture-in-picture storyboards, behind-the-scenes footage and insightful interviews, as well as pop-up trivia, a comic creator and more. Offering tremendous value and hours of entertainment for the whole family, the Double DVD Pack and Blu-ray/DVD Combo will be available as low as $19.99 and $24.99 respectively. Packed with high-flying action and non-stop laughs, DreamWorks Animation’s MEGAMIND puts a whole new hilarious twist on the superhero movie. Super villain Megamind’s (Will Ferrell) dreams have come true when he captures the damsel in no distress (Tina Fey) and conquers the city’s protector Metro Man (Brad Pitt), gaining control of Metro City. But when a new villain (Jonah Hill) is created and chaos runs rampant, the world’s biggest "mind" and his comic sidekick Minion (David Cross) might actually be the ones to save the day. For their first day on the job as the new protectors of Metro City, Megamind (Will Ferrell) and Minion (David Cross) are selling off the gadgets from their evil lair. But when one seemingly harmless "button" unleashes the gigantic robot MEGA-MEGAmind, the duo will have to resort to their old tricks to restore order in this all-new action-comedy from DreamWorks Animation.